Hearts earrings are the most popular from KAYA collection, now available with brilliant colored zirconia stones. Made of solid .925 silver and luxury wrapped in a pink sieradenbuideltje, as ready for gift giving. What a sweet earrings are these! Finish her Christmas outfit just a bit. Through-and-through real silver, forever beautiful. What will she shine! These earrings are true ceremonial pieces: Glistening AAA grade powder pink pearls with a sterling (.925) silver hook. Freshwater pearls are approximately about 4 x 5 mm. When I came to this text, I was in love! a flower on the front beautiful text on the back. Made of through-and-through .925 silver. Silver Pendant "If daughters were flowers I'd pick you"
Spend the summer feeling for life with this' silver childrens earrings ice cream. They are to eat! By-and-by with a silver-colored expoxykleuren. Luxury wrapped in a pink jewelry box. The love between mother and subsid is forever. 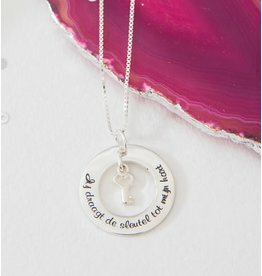 Beautiful silver necklace to give to the dearest mother. The through-and-through silver pendant is approximately 22 millimeters. Including fancy ball chain (40 or 45 cm).